On 15 June, the Toledo-Lucas County Port Authority announced that Cliffs Natural Resources Inc. will locate its first hot briquetted iron (HBI) production plant at Ironville Terminal in East Toledo. jobs and represents a ZAR 9,091 million investment in the Toledo Region. This project was made possible due to partnerships between the Port Authority, JobsOhio, Midwest Terminals of Toledo, City of Toledo, Lucas County, Regional Growth Partnership, and the Ohio Rail Development Commission. Cliffs Natural Resources Inc. will lease approximately 404,686 sq m on the east side of the site from the terminal operator, Midwest Terminals of Toledo. Existing infrastructure and material handling capabilities on the site met the company’s requirements for its site selection process. Construction on this project is expected to begin in early 2018, with the production of commercial tonnage of HBI beginning in mid-2020. Cliffs Natural Resources Inc. will receive more than two million tonnes of product, delivered by vessel, for the production of HBI, and has the potential to add 100 new vessel calls per year at the Port of Toledo. The finished product will ship from the facility via truck and rail. 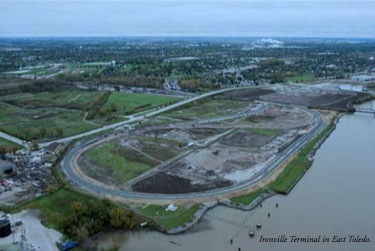 Ironville Terminal, formerly known as the Chevron property, was purchased by the Toledo-Lucas County Port Authority in 2008. The Port Authority formed a public-private partnership with Midwest Terminals of Toledo through a long-term lease for the property. The acquisition of IronvilleTerminal made the Port ofToledo the largest land mass seaport on the Great Lakes.Approximately ZAR 234 million has been invested in the site to date. The Port of Toledo supports 7,000 jobs and has an annual economic impact of over ZAR 13 billion on the local economy. Cliffs Natural Resources Inc. is a leading mining and natural resources company. Founded in 1847, Cliffs Natural Resources Inc. is recognized as the largest and oldest independent iron ore mining company in the United States. The company is a major supplier of iron ore pellets to the North American steel industry from its mines and pellet plants located in Michigan and Minnesota. Cliffs also operates an iron ore mining complex in Western Australia. Driven by the core values of safety, social, environmental and capital stewardship, Cliffs’ employees endeavour to provide all stakeholders operating and financial transparency.